When it comes to finding the right juice recipes for weight loss, the best by far are green juice recipes. Green juice has become incredibly popular over the last few years as a way of increasing the amount of vegetables you can consume in a day while also boosting weight loss goals. The key to using juicing to lose weight is to include plenty of green vegetables, and green juice recipes for weight loss include he best ingredients to pack a nutritional punch while keeping calories and sugar levels down. Green juices contain natural sugars which provide plenty of energy, however the other benefits that they bring are from the phytochemicals, vitamins, minerals and antioxidants that these green vegetables and fruits contain. When you juice green produce, the natural sugar in the ingredients become separated from the pulp and this gives you plenty of energy once those sugars are released into the bloodstream. If you add fruit to your fresh juice, you’ll be adding calories and sugar as well as nutrients and while this may benefit your body in other ways, it won’t help you to lose weight. Sticking to green juices means that you can keep the calories down since green vegetables are low calorie and low sugar. Green produce, especially cruciferous vegetables, help to boost the immune system. Ingredients such as broccoli, kale and spinach can give extra protection to your body’s cells for better overall health. These recipes combine a range of green vegetables and fruits that provide you with plenty of nutrients while improving your digestion, detoxing your body and promoting fat loss. This juice gives you plenty of antioxidants and fibre for speedy weight loss. Its cleansing and diuretic properties help to remove retained fluids and remove toxins for a healthier you. Peel the kiwi fruit and add to your juicer together with the lettuce, spinach and the water. Serve immediately and drink on an empty stomach for the best results. Full of antioxidants and digestive enzymes this juice is an excellent diuretic, helping you to lose excess fluids and fat. It can fight inflammation and boost the metabolism for better weight control. Chop and juice the ingredients with the water. Drink on an empty stomach for best results. This cleansing and slimming juice tastes great while ensuring that you get maximum benefit from the minerals and vitamins it contains. Peel the carrot, chop and add to the juicer with the other ingredients. Drink with breakfast or as an afternoon snack. This green juice is low calorie but high in beneficial antioxidants. It decreases fat absorption while stimulating the metabolism for easier weight loss. Chop the ingredients and juice with the water added. Drink in the afternoons as a refreshing energy boost. The juice detox has become very popular in recent years as increasing numbers of people are recognizing the benefits of juicing for their health. Not only is juicing a great way to include more fresh produce in your diet, it can also improve your immune system, give you an energy boost and even help you to lose weight. While many people have concerns about the sugar levels involved in juicing, the key to a healthy juice detox is to focus primarily on green juices. Green juicing allows you to unlock all the potential health benefits of fresh juice while keeping the calories and sugar content down. So, why try green juicing? Green juices contain natural sugars which provide a valuable source of energy. Made from vegetables and fruits which are packed with vitamins, minerals, phytochemicals and antioxidants, green juice is great for giving yourself a much needed energy boost since the natural sugars become separated from the vegetable’s pulp through the juicing process. When you add fruit to your fresh juice, you will be adding more taste and nutrients, but you will also be adding extra sugar and calories. However if you try a juice detox while drinking only green juices, you can benefit from all of the essential minerals and vitamins while enjoying weight loss. If you spread your intake out over the course of the day rather than just having a couple of calorie-heavy servings, you will be able to better balance your metabolism avoiding weight gain. If you are planning on working out as part of your juice detox, it’s important to consume your juice at the right time. When you juice vegetables you are removing the fiber, making its sugar content easier to access. That means that it’s important to make good use of that sugar. Consume your green juice within half an hour of exercising and it will help to restore much of the glucose which you used up while you were working out, preventing your muscles from using up protein as their source of energy. If you can use up the sugar content of the green juice by replacing the stores of glycogen which were depleted when you were exercising, the sugar will not be stored as extra glucose in the body, helping the limit the chance of it being stored in the body as fat. Your immunity can receive a valuable boost from cruciferous vegetables thanks to the many nutrients and vitamins they contain. Green juicing uses fresh vegetables such as broccoli, kale or spinach as the base and this can provide further protection to your body’s cells. As green juices are rich in vitamins E, C and other antioxidants, you will find that your skin is healthier and more glowing. Antioxidants in green juice are helpful in ridding the skin of any harmful toxins that could cause sun damage or acne, while vitamin A, which is also in plentiful supply in green juice, boosts skin cell regeneration and growth. Green juices also hydrate the body, another vital element in caring for your skin. Green juices made from leafy vegetables contain amino acids which are essential in building protein. If you are suffering from a deficiency of amino acids, you may struggle to lose weight, have thin hair, brittle nails, eye bags, insomnia and frequent colds. All of these things can be combated by green juicing. It is clear that green juicing can help to improve your overall health in a multitude of ways.It is also a really great way of consuming more green vegetables which can be difficult to include in the daily diet. Juicing enables you to get closer to your 5 a day target in a more delicious way. Wheatgrass juice is the perfect all-in-one supplement to help you to achieve flawless skin, healthy hair and weight loss. This natural supplement has been used since ancient times as a beauty aid and to promote good health, and it even has natural healing properties which have been known for generations. Just a single glass of wheatgrass juice is packed with chlorophyll, liver enzymes, amino acids and vitamins. In fact, it boasts 98 of the 102 earth elements which come from the soil including potassium, magnesium,iron, calcium and phosphorus. Wheatgrass also contains more vitamins C and A than carrots and oranges, and is also very rich in the vitamins B,K and E.
How Can Wheatgrass Benefit The Body? Juicing wheatgrass enables the natural phytochemicals and vitamins it contains to slow the natural ageing process down, while detoxifying the body. It can enhance your natural health and promote healthy skin. It can also help to cure skin diseases such as psoriasis and eczema and can help to remove blemishes and scars. Wheatgrass boasts natural cleansing properties and it can remove any dead skin cells from the scalp to promote healthy hair growth while bringing a gorgeous sheen to the hair. A daily drink of wheatgrass juice can help to boost weight loss by removing the harmful toxins which can build up in the body to held shed the extra pounds. As wheatgrass juice also helps in the management of the thyroid gland which could be slowing the metabolism resulting in weight gain. Wheatgrass juice is also rich in potassium which can burn calories more rapidly. Another benefit of wheatgrass is that it has a high nutrient value and so it can help to reduce cravings for unhealthy foods. Since wheatgrass is packed with chlorophyll, it can help to build up the immune system and fight harmful bacteria. With 70% chlorophyll in every glass, it can protect the internal organs from damage caused by smoking, heavy metals and pollution and ward off illnesses. Wheatgrass has been shown to help protect against a number of illnesses and diseases. Since it helps to build the body’s red blood cells to supply more oxygen around the body, it can decrease carbon monoxide levels and lower the risk of developing cancer. The enzymes in wheatgrass may help to dissolve tumors while its 17 different amino acids help in building muscle tissue, clot blood and repair cells. It even has natural antiseptic properties to heal cuts, bites, bruises and rashes and its vitamin C content promotes good eye health. Regularly drinking wheatgrass juice reduces the level of acidity in the body to combat diarrhea, ulcers and constipation and stabilizes blood sugar levels. It is important to always drink your wheatgrass juice straight after juicing. 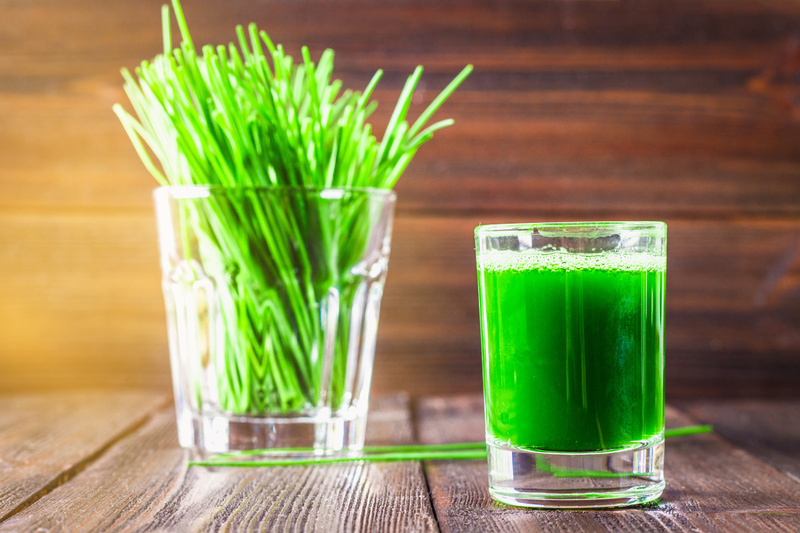 One ounce every morning when your stomach is empty is sufficient if you are drinking pure wheatgrass juice, however if you don’t like the taste, you could always add it into your green juicing regime for a tasty way to increase your nutrient intake.